Calendar@: Do You Remember This Speech? Patriotism is high all across the counrty as Americans wake up early in the morning and stay up late at night to watch the best athletes on snow and ice compete in the winter Olympic games. With the games drawing to a close, now is the perfect time for one more dose of a classic patriotic moment that channels much of the same sentiments that hockey fans felt last week when the US hockey team took on Russia: President Reagan's speech at the Brandenburg Gate. 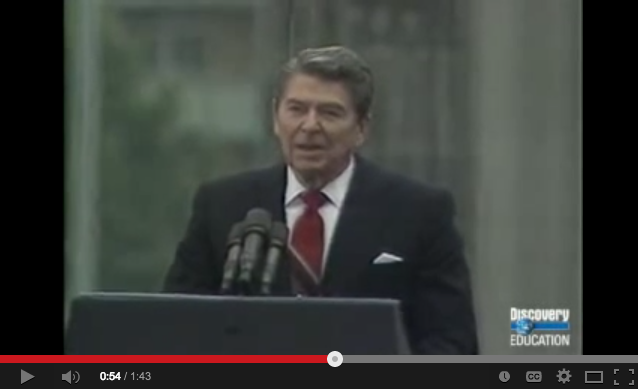 So start the week off right and enjoy this clip from Reagan's historic speech. May his resolve and passion for freedom be an example for us all!